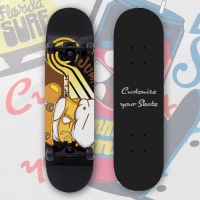 Easy upload your design to make your own decks. Seven layers maple wood material, very stable. Black coating stainless steel frame 5AAA. High pressed PU wheel 95A level. Question: what kind of trucks does it have? 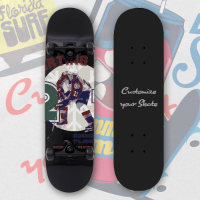 Question: Can I use my own design and the printing is as big as the skateboard? Question: How long is about the delivery? it's a gift for my girl friend. She love it. It's very beautiful and cute cover. the quality is very great.. Thank you very much. Thanks for your feedback and great info, it is really our honor! 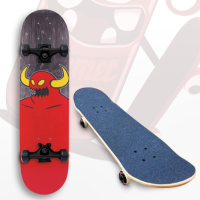 This skateboard is perfect. I got it as a gift for my friend. He loves it very much. I custom it by myself. Bought this skateboard for my friend's son who just starts to learn how to play. The design is cool, he likes it and the size just fit him. Maple wood material feels sturdy and wheels are really smooth. Thanks for your great feedback, you satisfaction is really our honor! Beautiful board! I'm having a hard time waiting until Christmas to give this to my son. Very well!I bought this skateboard for my son. He loves it! I love the quality and the cool decoration on it. Highly recommended! 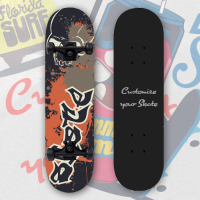 The quality of the skateboard very great.This is the first product I've ordered/created on Brightent. The Print of it is very Clear and exactly as pictured.